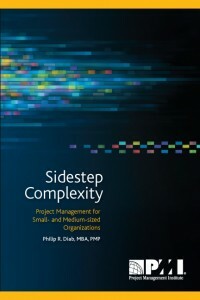 As a companion to my book Sidestep Complexity I’ve launched this section of the website to offer free templates to support project management practitioners, especially professionals who are new to project management. For businesses of all sizes, templates can greatly enhance consistency and repeat-ability on projects. These templates are provided to help give project management practitioners a start. They are not intended to be a finished product as they may or may not meet the specific needs of the given individual’s organization. Detailed customization or tailoring may be needed to address circumstances and organizational culture. These templates are provided free of charge and are intended for individual use only. PM practitioners may use them for their projects and in collaboration with their teams. The templates are not intended for reproduction or sale. Disclaimer: Using these templates does not guarantee specific results as the practice of project management requires knowledge and experience that can not necessarily be encapsulated in a template.